UPDATE: THERE WILL BE NO GOOD FRIDAY SERVICE DUE TO INCLEMENT WEATHER AND AN ABUNDANCE OF CAUTION FOR THOSE TRAVELING. 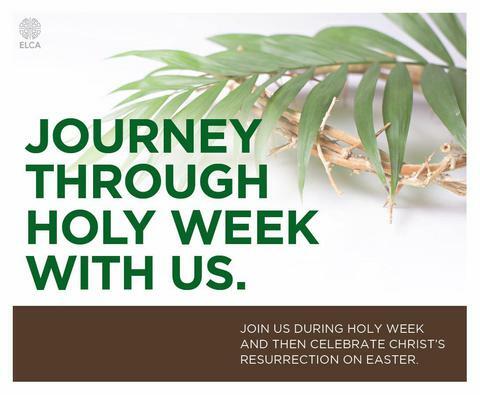 Holy Week begins on Sunday, April 14th with Palm Sunday as we begin worhship outside with our palm leaves at 9:45 a.m. Our next service is on Maundy Thursday (when Christ had his last supper) at 7 p.m. and we end the service stripping the alter and leaving the church in silence. On Good Friday we worship again at 7 p.m. and we each place a nail in a large cross signifying Christ's crucifixion. We leave the church in silence again. On Easter Sunday we celebrate the risen Lord at 9:45 a.m. and hold a pot-luck brunch afterwards. All are welcome! We still worship in a former stable and we think our humble church is a perfect place especially at Christmas and Easter. 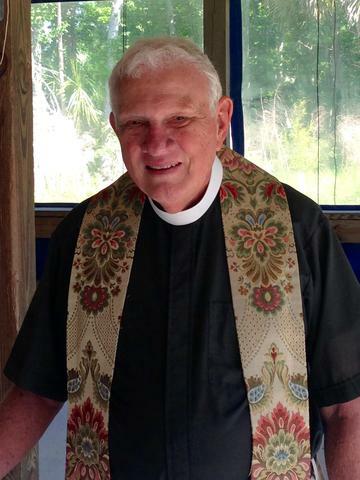 Shhhh...Pastor Hinkley is celebrating the 45th anniversary of his ordination! Please join us to celebrate the 45th anniversary of the ordination of our kind, warm-hearted, funny, dear Pastor Hinkley on June 9th! We all value the clear insights he provides on our faith journey each week and a peek at his own with his stories! Listening to his sermons is life-affirming and refreshes the soul for the week ahead! We will be having a pot-luck buffet luncheon after service that day, along with cake and a wine toast to celebrate this milestone. Mark your calendar: first Lord of Life Roscoe Rummage Sale! 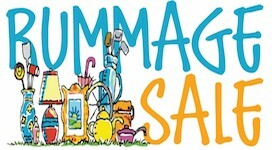 Mark September 14th on your calendar from 8 a.m. to 2 p.m. at Lord of Life for our first annual Roscoe Rummage Sale! This fundraiser will support the building fund for our new sanctuary, and a portion of it will go to a local charity. We will use the Pavillon for the sale, so we'll be on rain or shine with thematic areas inside such as "kitchen goods"; "home decor"; "sports and hobbies" and more! We have plenty of parking on site and look forward to seeing you as you hunt for some great bargains! 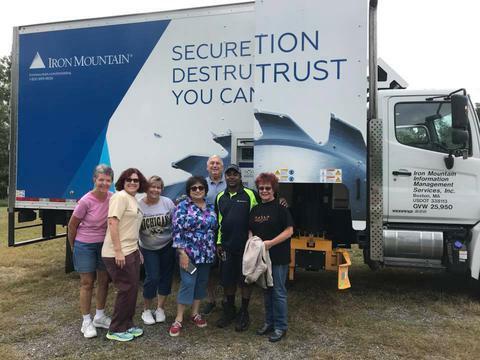 Thank you for joining us on November 10th when we had the award-winning document destruction company, Iron Mountain onsite to shred all your sensitive, old paper! We look forward to making this an annual community event! We know how much paper we all collect and sometimes those mini shredders at home just can't handle the volume we want to purge! We were glad to help you unload it and watch it be shredded on the computer that was on the side of the truck! As a fundraiser for the building of our new sanctuary, we requested a donation of $25 per car wishing to dispose of paper. The Great Pumpkin Patch is Over for another Year! 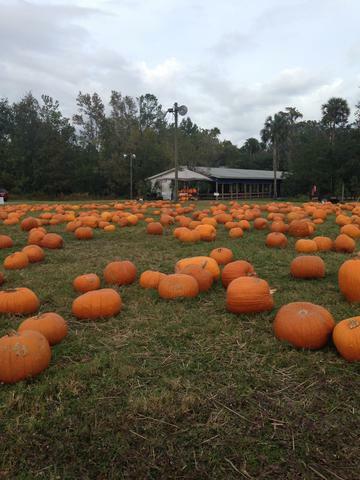 Thank you for attending our famous Pumpkin Patch! With all the frontage our church has on Roscoe Road, there really was a 'patch' to wander through to select the perfect pumpkin(s). We had white, orange, grey/green pumpkins as well as bumpy 'warted' ones (great for a witch design) as well as two-tone. Inside we had wonderful selection of minis in orange and white, swan gourds and more. Best of all, we'll had our famous 'PPP' - Pumpkin Pies baked from scratch from our Patch! We sold 150 of them last year and we are waiting to find out what this year's tally was! We are grateful to St. Matthew's Lutheran Church of Jacksonville for their kind donation of this cross which hung in their sanctuary for many years. It will look beautiful when it is properly hung in our new sanctuary! We love its simplicity. St. Matthew's approached us recently and informed us that their building had been sold to another church that had their own cross, and would not therefore need the one in their santuary. While St. Matthew's is still worshipping at the same site right now, it is downsizing its belonging. Again we are thankful to have this Cross that so many prayed before and held a place of special importance in a fellow church. Blessing of the Animals Oct 7 @ 9:45 a.m. Thank you to everyone who came out to celebrate the Blessing of the Animals! We had lots of licks, tail wagging, heavy breathing and various howls from our four-legged friends who attended. The hybrid service include communion, a blessing of the animals, a handout of the Rainbow Bridge poem and tasty treats for dogs (courtesy of our Ponte Vedra neighbor Pet Supermarket on A1A). We also had a drawing for a beautiful dog bone and a portable water bowl that were won by dogs Bella and Beau! Lord of Life welcomes therapy dogs in training the first Sunday of every month; and has a few parishioners who occasionally bring their dogs to church. The church recently had a ‘lost’ dog wander in and quietly attend the full service before Lord of Life was able to locate its owner! “Given that we currently worship in a stable, we think this is a great location to celebrate the wonderful role pets play in our lives,” said Cindy Tanton, Lord of Life Church Council President. A Harris Poll found that 95% of pet owners consider their pets to be members of their family, and 45% of pet owners frequently or occasionally buy birthday presents for their pets. 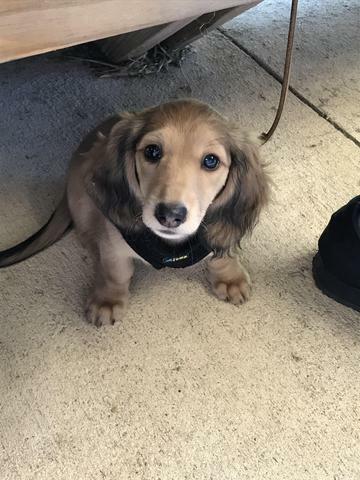 This picture is of one of our congregant's dashchunds named Dixie that attends church occasionally! The footprint of our new sanctuary that will be built shortly - we were delayed last Fall and required to look at the plans again following hurricane Irma. While under construction, our current pavilion will serve as our sanctuary. If you would like to donate towards our building fund, we would be delighted! Due to the structural changes now required, we have had to modify our plans, and it's increased our costs. We want to install a glass front window as you can see on the design below, and because of the requirements for it; we are looking at a cost of about $100,000. You can see the list of needs for the church under the Building Update tab. Thank you! The steel has arrived for our new sanctuary! 23 tons of steel was delivered on February 24th to much excitement! Please go to our "building update" for a group of pictures! Here is a link to an article in the Ponte Vedra Recorder about the shipment! (Click on the word Recorder). Future worship home: We broke ground on June 11, 2017! 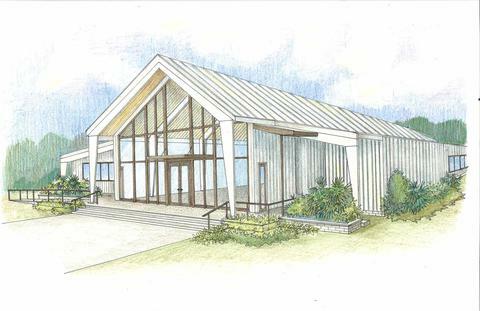 We will build a new 75-seat sanctuary on our property, and it will be climate controlled. This will be the first permanent building in the church's history! We hope to be more relevant for the community and will have room for Sunday school, or other classroom use, and more. This is the architect's rendering to give you a feel for how we plan to build, respecting the natural beauty and community of Ponte Vedra Beach. See our Building Updates page for more information. About the church: Worship is central for our life together, for that is where we celebrate the love and forgiveness we receive from our Lord, Jesus Christ. We gather for worship at 9:45 a.m. each Sunday at the Lord of Life Pavilion at 276 N. Roscoe Blvd., Ponte Vedra Beach. This church is part of the Florida-Bahamas Synod of the Evangelical Lutheran Church in America. About the people: One of the greatest strengths at Lord of Life are the people who are welcoming, friendly, and truly care. Our congregants range in age from elementary school children to seniors age 80+. Most of us have relocated to Florida from other states, with diverse interests and current (or former) careers in real estate, global communications, orchestra members, a horse owner, a flight attendant, a principal of a high school and others. We live in Ponte Vedra Beach or surrounding areas (Ponte Vedra, Nocatee, Jacksonville, St. Augustine, and some snow birds who are with us during the winter). 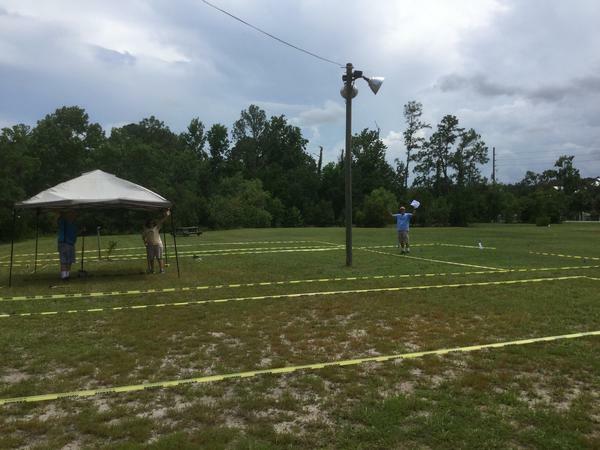 About the Pavilion: The church property was formally a horse farm and when the congregation first acquired the property over two decades ago, they worshiped in the stable, however it is not climate controlled - and occasionally we have a bird or anole join us! This structure has been renovated to include handicapped accessible restrooms and a full commercial kitchen. If you've recently moved to Ponte Vedra, Ponte Vedra Beach, Palm Valley or Nocatee, and are looking for a Lutheran church home, or simply a place to visit, we invite you to be our guest. Experience a casual worship service in God's natural surroundings. This rustic open-air pavilion was formerly a horse stable (very fitting for our Christmas season) so we hear birds sing - in fact, we had a bird nest in one of the Easter lillies last year that was a great sign of new life!